The Animal Game is a solid PC implementation of a board game of the same name that is very popular in China but little known outside. Also known as Shou Qi or The Jungle Game, this board game is similar to a cross between Stratego and Chinese Chess. 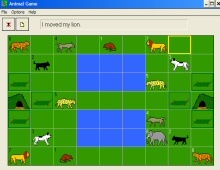 In this two-player game, each player controls eight animals that can move one step at a time on the board and capture animals that are smaller than they are. The game's objective is to get one animal into your opponent's den. Each animal can only move one step at a time, except lions and tigers that can "leap" in one step across the river or over land bridges. Like all great board games, The Animal Game is easy to learn, but hard to master. The existence of real-world terrain including rivers (in which no animals except the rat can swim) and pits (which violate the usual "big animals capture smaller ones" rule - any animal can capture a bigger animal that is in the pit) adds a nice strategic layer to the game. Also, I like the fact that the game gives special consideration to the rat, which is the smallest animal on the board. Although the rat can be captured by almost every other animal, it can defeat the elephant, as well as swim in the river. This, similar to the possibility of pawns turning into Queens in chess, makes the rat vital to the game. This computer version lets you play against the computer at varying skill levels, and even at "normal" difficulty the AI puts up a good fight. If you enjoy chess or abstract board games in general, this rendition is sure to delight. Formerly shareware, the game has been released as freeware by its author. Highly recommended!